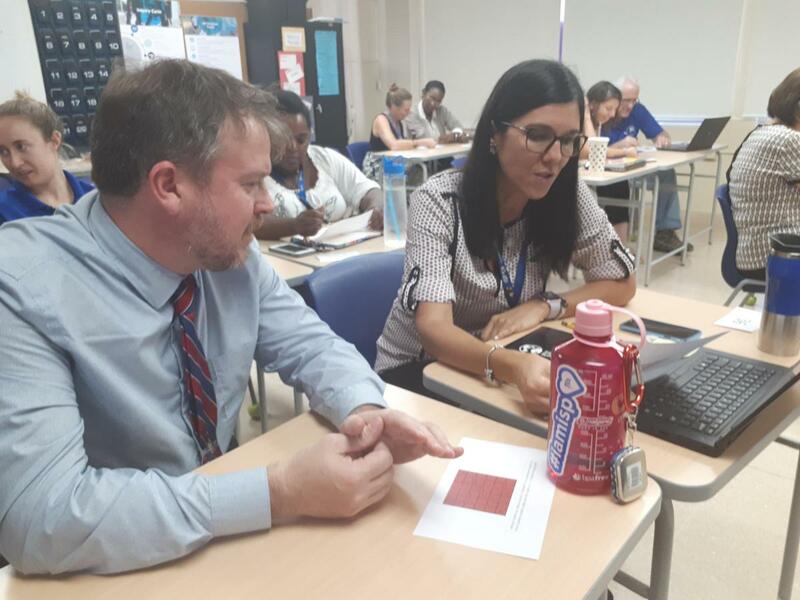 A few weeks ago we had the opportunity to visit our Math Coach Marina MacDonald as she led a new Math Mindsets professional development session with faculty. 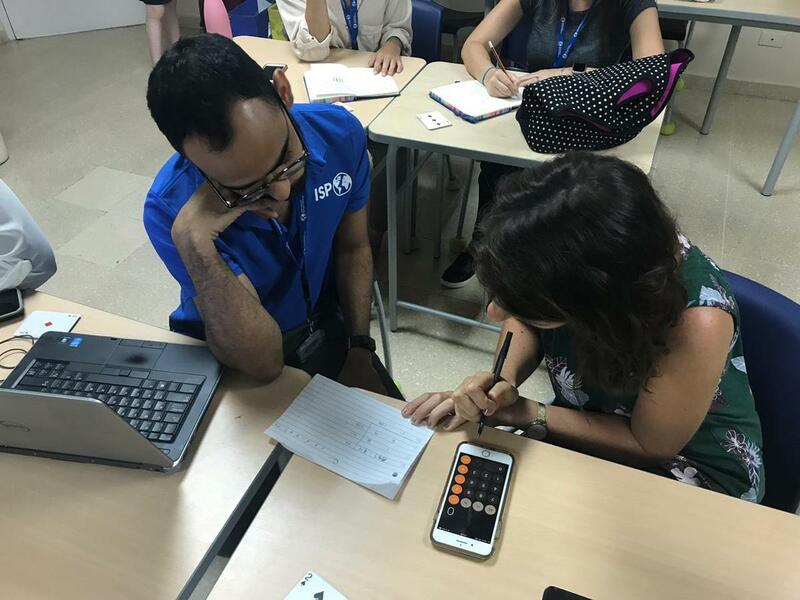 After watching her work with her colleagues, we sat down to learn a little bit more about Math Mindsets at ISP. What is Math Mindsets and what makes this approach unique? What makes this professional development session unique is that we are practicing sustainable professional development at ISP. In addition to collaborative meeting times and co-teaching or modeling, this is an opportunity for interested faculty to actively engage in practicing strategies from an online course at Stanford University. Rather than listening and reading to the course content, we come together and talk about how it applies to our students, our roles at ISP, different content areas, and what it means for us in terms of influencing our individual practice. In our session, we discuss growth versus fixed mindsets and we are thinking of what that means for our students and also for ourselves. We ask questions such as: What triggers our fixed mindsets in our educational practice and how we can work together to move towards a growth mindset? How can we relate our experiences to those of our students in our classrooms? Which is interesting because when you empower the educator, you’re inadvertently empowering the students, correct? Exactly! During these sessions, I ask participants to take the role of students. How do you feel when faced with a challenging situation or problem? Do they feel nervous? Do they feel like they cannot do it? Do you immediately ask one of your peers for help? Do you feel like you want me to tell you what to do? I ask them to reflect on what is happening within them and why. Then, we start having a conversation about what I could have done better or differently to make them feel confident as mathematicians. We extend our personal experiences to how this might apply to our students in our classes. Can you tell me a little bit more about the activities you do together? We start as soon as the participants enter the classroom. I gave each person a card with no instructions (you can see an example of the card given in the pictures). I asked them to pair up based on their cards. Some people got very creative and got right to it. Other people felt like they needed to ask more questions to make a decision on how to pair up. Some teachers even pointed out there could be more than one answer to the question I was posing, so I asked them to pick what made the most sense for them. We used this exercise to begin thinking about and exploring fixed and growth mindsets. 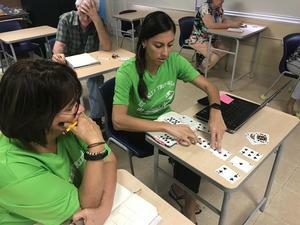 Essentially we are shifting math education from finding the one right answer to reflecting on what we know, what we wonder, and all the ways we might approach a problem. Mathematics is connected and creative, so when we focus on that one right answer we tend to forget about all the different paths that can get us to our destination. This is the math mindset we want to shift to as well as celebrating and learning from taking risks and making mistakes. Together, we do number talks, math puzzles, games, and more. The objective is to make math visual, find new ways of knowing math, and to strengthen our own creativity when solving math tasks. We also explore ways to create a classroom environment that is conducive to learning, taking risks, making mistakes, and growing mathematically. What stands out about this process for you? 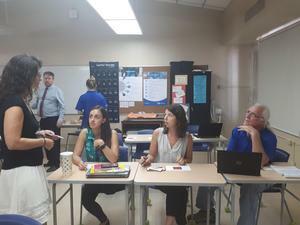 What’s interesting is that when you get a group of teachers some, who teaches math and some who don't or who only teach for part of the day, you get a mix of experiences. Additionally, we are all from different generations and we experienced math in different ways so that makes this process even more enriching. Together, we are trying to find creative ways of thinking to help push towards a growth mindset in validating different ways of approaching learning. We learn so much from each other and this deepens our own critical understanding. What about students that have a particularly hard time understanding mathematics, how does a growth mindset help shift their thinking about the subject? We are learning how to make math more visual and tactile. In addition, we talk about questioning strategies that support struggling students to find their mistakes, collaborate, and persevere. We want to do this so we can help students understand that there are different ways of understanding math and that they can use their own creativity to explore, generate ideas, and overcome the challenge. 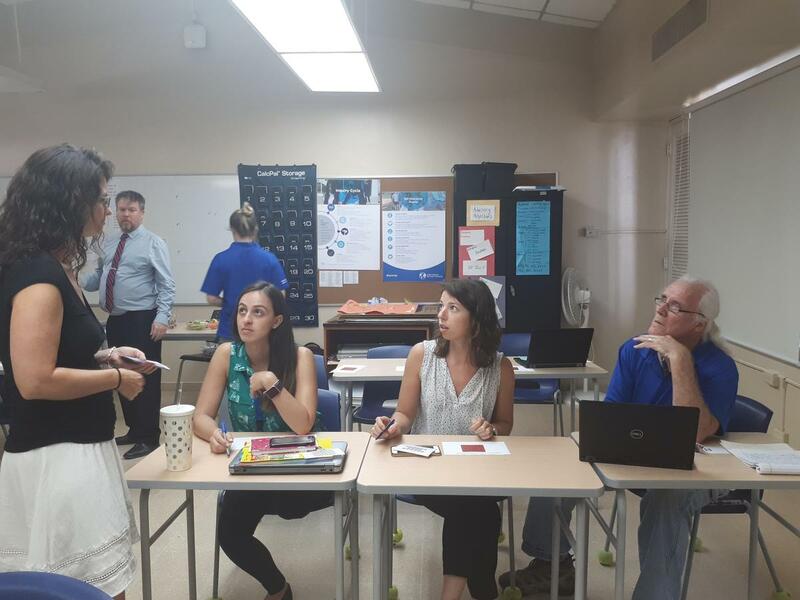 Therefore it’s quite valuable that this group isn't just made up of faculty that teach math, we have an array of educational professionals that help us broaden our perspectives even further. Although we are certainly looking at this through the lens of mathematics, the course applies to all areas of our educational practice. 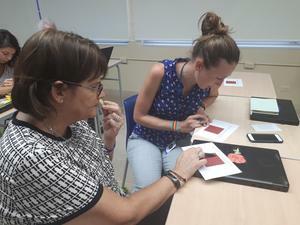 Faculty who took this course last year have changed their own mindsets and are implementing new instructional strategies into their practice. This weekly in-house PD is sustainable because we are complementing the course with our own resources as we work together. We practice, take risks, refine our thinking, and share our learning weekly. I see evidence of this work when I visit classrooms and work with students. They talk about their mindsets, making mistakes, modeling problems visually, and persevering. Has there been a change for students so far? Absolutely! 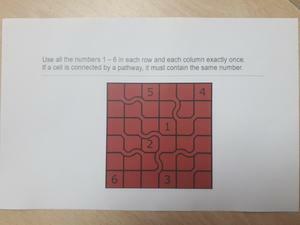 Students love finding unique ways of solving math problems. I often observe students who are not satisfied with one approach. 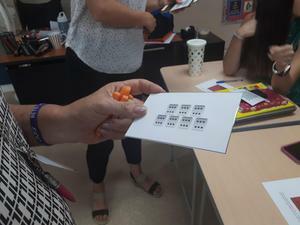 Rather, many students are interested in finding multiple approaches, generalizations, and visual representations. There is palpable excitement in the classrooms I observe. I hear students saying “I can show you three different ways of knowing now” which is a major shift to simply shouting out the “one” answer… Additionally, there is an urgency to share their thinking and communicate the ideas they have. These are the qualities of strong mathematicians that will be creative, open thinkers in our ever-changing world. So mathematics shifts to thinking more about the problem itself rather than focusing only on obtaining that one correct solution? Exactly. When you look ahead to 30 years from now, when some of our elementary students will be in the workforce, many of the jobs they are going to be doing don’t actually exist at this moment. We know that we have the large task of preparing them to find solutions to problems that we don’t even know about yet. This requires creativity and an ability to get around or through any obstacle that comes their way. There is no algorithm for what is to come. When students can discover algorithms on their own, make generalizations, and solve problems from multiple entry points, they will be better prepared for the future. It is also our goal to encourage more students to enroll in math at a higher level. It is an outdated belief that you are a “math person” or not. In some of the more traditional classroom settings, students can be made to believe that they can’t learn math. All students can learn math. It’s up to us to provide the environment, tasks, and opportunities to allow for this. Sometimes that means learning math all over again with our students in ways that we never experienced. We seem to struggle with balancing rich tasks with “covering content”. This is a shift that feels vulnerable to people and requires practice and training. We could teach students all of the skills, procedures, and algorithms. We know some of them could take notes, notice patterns, and solve math problems this way. However, as Albert Einstein said, “Education is not the learning of facts, but the training of the mind to think.” Students can learn math, discover algorithms, theorems, and procedures with the right questions and tasks. They do not have to be explicitly told. This idea is expressed well in the book The Mathematician’s Lament by Paul Lockhart. The author introduces the analogy of learning music. We allow kids to play instruments, listen to the sound, experiment, and explore when they are very young. Can you imagine if we asked students to learn the names of the notes and how to read musical compositions before hearing what the instruments sounded like? Can you imagine if we required them to take notes on scale and mode and meter and harmony before strumming a guitar, blowing into a trumpet, or pressing the piano keys? Mathematics is so beautiful and there are so many patterns and connections to be made. The skills and the procedures will come and we will practice...a great deal. The challenge is in making room for students to play with math, listen to what they are figuring out, experiment, explore, make conjectures, make mistakes, and discover.